Hearthstone is back once again for Spring 2018 with $150,000 in scholarships and prizing! We have created a comprehensive shorthand guide book to be a convenient one stop place for all rules relating to this tournament. The short hand guide book and rules on this page are not intended to replace the Tournament Rules. Registrants should carefully consult the Tournament Rules and Player Handbook for additional requirements concerning the operation of the Tournament. College students in the United States and Canada. Students must be currently enrolled, or enrolled for the 2018 Spring Semester by January 22nd, 2018. Students must maintain a 2.5 cumulative GPA or higher to compete in the Varsity Division. Players must be considered legal residents of the United States or Canada. Foreign students under a valid visa are eligible. Players must be the age of majority in their country of residence or under the age of majority but over 13 (a minor) must have parental consent to participate. Players must have registered an account at Compete and a full Blizzard account. Eligible teams consist of 3 players. Only 1 maximum team per school may play in the Varsity Division. Students must maintain a 2.5 GPA to compete in the Varsity Division. Students must maintain full time status to compete in the Varsity Division. School administration must have sanctioned a varsity esports program and designated the specific team roster as their varsity team to play in this league. All players must attend the same school. Players must verify their school enrollment during registration by attaching a valid school email to their profile. Students of schools that do not provide a school email can contact support. Additional proof of enrollment may be required. For questions about registration and eligibility, feel free to Contact Us! How do we play our matches? Matches will be assigned on the "Brackets" tab, they can also be found on the "My Matches" tab when logged in. Matches will be assigned each Wednesday night. For this tournament decklists will be open. All decklist submission and class bans will be done through the “TespaBot” in our Tespa Compete Discord channel. TespaBot can be found in the Discord channel called #Hearthstone_bot_summoning. More information about Tespa Bot can be found by typing “!hsmatch” into the chat box of #Hearthstone_bot_summoning or by consulting the Hearthstone Player Guide. Before each match, teams will be required to submit four decklists from four different classes – one deck per class. Once the four classes for each team are submitted and revealed, each team will then ban one of their opponent's four classes and play out the best-of-5 with the remaining three. Each round is assigned a match time and may vary by region (see the above schedule). Teams must be online and ready to play within 10 minutes of their assigned match time. If a team is not status marked "ready" by this time on TespaBot, this will count as a match loss. If a problem, in-game bug or other client-specific error prevents the teams from being able to make their move, the game (and or challenge) must be immediately remade. This rule does not refer to disconnects or internet connectivity issues. All players are responsible for their own internet connections. Matches can be played earlier if both team captains agree and they document the agreement in writing (e.g. a screenshot of the in-game chat, email, etc); however, they must wait until the team's scheduled match time to report the score or contact compete@tespa.org. Matches cannot be played later than their assigned time. This only applies to games played in the Regular Season. If a team captain does not agree to play earlier, failure to be online and/or marked as “ready” with TespaBot during the scheduled round time will result in a warning. Failure to be online and/or marked as “ready” within 10 minutes after the round begins will result in a match loss for that team. It is up to the team captain to screenshot each victory and defeat screen during the match for match dispute purposes. Upon match completion, the winning team's captain must report the win to their match page on the Tespa Compete website. During the Regular Season, matches must be reported within an hour of the conclusion of a round. During Playoff dates, matches must be recorded 10 minutes before the start of the next round. If a win is unreported, both teams will be assumed to be "no-shows" and will not be assigned a match for the following week. If the team captain is unable to report the score, reports the score incorrectly, or the other team records the score incorrectly, that captain must contact a tournament admin with relevant evidence to show the correct outcome. Screenshots of communications and matches with your opponent are extremely helpful for settling of any match disputes. Please screenshot anything and everything you believe might be important! If you are having an issue with your match, please be sure to contact an Admin immediately, either through Email or Discord! All decks will use the current Standard format at the time the match is played. Teams of 3 work together to play one best-of-5 Conquest match. Teams can play together in person or over VoIP (e.g. Skype, Discord, etc.) while spectating through the client. The three players on a team strategize together to make each move, using a single Blizzard account and a single deck per game. The team players may confer between themselves, but they may not take outside advice. 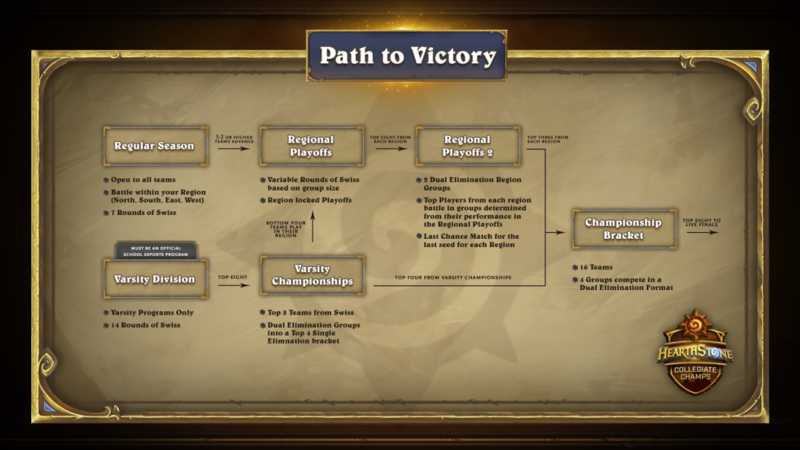 Class and deck selections must follow the Conquest format. Before each match, teams will be required to submit four standard decklists from four different classes – one deck per class - to the TespaBot. After the four decks of each team are revealed, each team will then ban one of their opponent's class, and use the three remaining classes to play the best of-5-Conquest. If a team is found to have queued an illegal deck that is still playable (submitted class that is not banned and hasn't been played yet) then they will receive a game loss. If a team queues an unplayable deck (banned or already played in the series) then that team will be given a warning. Teams may switch to another team member's account between games after clearly communicating to their opponents which account they're switching to. Teams may only use accounts that are listed on their official roster on Compete. Teams have a maximum of 5 minutes to select a new class between games. The match format for Live Finals will be standard Conquest for Round of 8 and a "9v9 Class Match" in which each team plays all nine classes for all rounds onwards.